Today I'm sharing with you a great, inexpensive way to spice up a boring tank top. One of my all time favorite bloggers has shared this genius idea with the world. Erica Domesek is the author of the P.S. I Made This blog, as well as the P.S. I Made This book. GB's wonderful sister KC gifted me with her book over Christmas and I've been so inspired to try many of her inspirations. I decided to give Erica's Safety Pin Tank a try. Check out her wonderful idea! Check out that clearance tag! WARNING: It really hurts when you stab your finger with one of those big daddy safety pins. When I completed combining and clustering the pins I attached the pins to the tank. I then began attaching the pin clusters to one another. When I was finished I held the top up and adjusted some of the placement of the pins. All done! I really think it looks edgy and cool. Then I tried it on. The placement was all wrong! I should have placed the pins at least 2 inches higher. Safety Pin boobies is not where it's at. Good thing safety pins are removable. 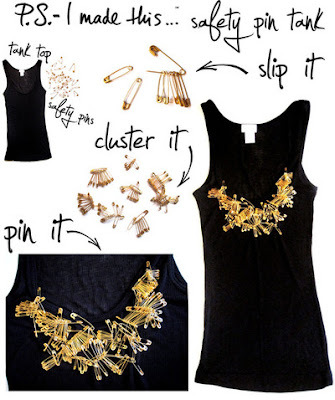 I love this look - but when I'm ready to rock this look - I'll be sure to put on the tank - then adjust the pins. Love the blog! Especially the DIY projects. It's like you're my own person mistake maker before I cause the mess, love it! I just created my first blog too, would love for you to check it out and give any feedback! THanks for reading!!! Your blog is great! So creative! It looks like you found your perfect niche!